"Finally, a main course that says 'Dinner!' and doesn't just look like a salad or a bunch of side dishes! I'm looking forward to having frozen slices ready for lunch at work, or dinner after a long workday. So grateful!" Welcome to Loafing Around With Jeff, a 100% plant-based interactive online course that will teach you how to use the ingredients you have on hand to make easy vegan, delicious and nutritious meatless Veggie Loaves that will transform your meals from boring to fun. When you have Veggie Loaves on hand, you can skip a day (or two!) of cooking and enjoy a filling and nutritious meal created with the flavors that you love and that your family can all get behind too! Missing That Central Focus On Your Plate Meat Used To Fill? Veggie Loaves To The Rescue! If it ever seems to you that vegan meals are just a bunch of sides pulled together in various ways you're not alone. Back in your pre-vegan days there was always a central focus on the plate. Something to build the rest of the meal around. The good news is with just a few tweaks to your routine, you can easily create meatless Veggie Loaves — that you'll enjoy making as well as eating — that will once again give you that focus on the plate you've been missing. Loafing Around was created to help you overcome these problems we hear from our community on a regular basis. Exhausted. You need a break from the kitchen once in a while! And if you're from a mixed family (some Veg*n and some non-Veg*n) they're used to having their old non-vegan standby on the plate (like meatloaf, chicken, or steak). And if you so much as attempt to replace it with something that you can all enjoy (that's also good for you!) all hell breaks loose; am I right? Meatless veggie loaves are the answer! "Well done video series. Valuable content with a simple process to begin using right away. Presented in a straightforward manner that valued our time and allowed for different student pacing. Worth the money - not only in content provided, but also in reduction of future food waste!" 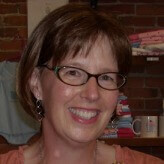 "I loved the videos because I learn better by having the visual with the narration rather than reading instructions. I am confident to try more experimenting in all of my cooking. I appreciate that with every veggie loaf I make, I learn lessons and takeaways that are helping me become a better cook." I didn't always make loaves like I do now. In fact, when I had the idea of making recipe-free no-meat veggie loaves I had never made one before in my life! Many of our Vegan Coach friends were having a big challenge coming up with meals that would not only satisfy themselves, but their picky family, too. What was the missing link that would make everyone happy? Most plant-based cooks were missing a central focus on the plate that you can build the rest of the meal around. What if you could easily create your very own "vegan meatloaf" made of healthy and organic whole foods you have on hand -- without having to rely on convenience foods? I could imagine this is a dish that anyone would enjoy, especially split households, where some are Vegans and others aren't. 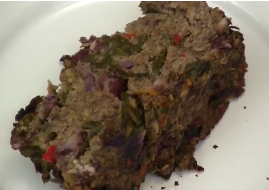 Everyone could get behind a well-made, delicious, moist and satisfying no-meatloaf! Meatless veggie loaves are beautiful and can add so much to your plate. ...figuring out exactly how to make my very own Veggie Loaves chock full of vegetables, whole grains, beans, nuts and seeds, herbs and spices and other seasonings. I quickly realized the most crucial part: The binder. Because if your veggie loaf doesn't hold together and cook up moist AND firm, it's not a loaf but a casserole! There were a few failures along the way. But little by little I started to figure it out. It took a lot of trial and error to figure out the ratio of ingredients. And seasoning loaves are a slightly different ballgame too so the flavors come through in the final cooked loaf. If you're looking for the perfect meal to enjoy not only for dinner but for handy lunches too, then you're going to love learning how to make your very own Veggie Loaves. In fact, that's why I created Loafing Around With Jeff. Because I want you to learn how easy it can be to create made-from-scratch meatless loaves based on nutritious whole foods. 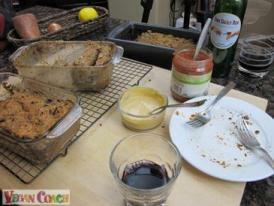 ...you'll learn the magic making Veggie Loaves can bring to mealtime. I'll show you step by step how to create your very own tasty and nutritious Veggie Loaves using simple tips and techniques that I promise you will not only find easy but that you'll enjoy because you'll tap into your own creativity in the process. We'll begin with a general overview of my loaf-making techniques before we dive right in and get cooking. And Sassy even steps in to give you a few easy tips about making your own recipe-free vegan sauces from scratch that you can use to smother your delicious loaf if you'd like. Check Out These Gorgeous Meatless Veggie Loaves Created In Class! These veggie loaves were made by our students. The BEST way to learn is to just step into your kitchen and start playing with your food! And that's what you'll do during the course as you cook-create using the simple techniques I'll share with you. Rely on your creativity and intuition which makes the entire process a breeze. Believe me, if I can do it ANYBODY can. Truly! I Would Love To See YOU Have Success Creating Veggie Loaves, Too! Got her to step up and embrace 'cooking on the fly' -- and her son got in on it, too! "Watching you add the ingredients together in the videos took me from 'Hmmm, maybe I should just stick to what I know so far' to throwing all kinds of stuff together and not being afraid of the outcome!" Enjoys using flavor matches, what tools to use, and the RATIOS! "This course has opened my eyes to the many possibilities & variations of my own veggie loaves with the ingredients I can eat (without needing to fear failure). It has offered me the comfort of knowing I can make something that is very filling & nutritious, easy to store and fun to make without having to worry about next-day lunch or dinner (or even breakfast). "This is a great course for visual learners who crave a sense of variety, freedom, lightheartedness & experimentation without being bogged down by tons of details. Excellent for getting the bigger picture first (divided in clear & concise chapters), and then the necessary details (i.e. cooking tools, cooking time, ratios). Very, very liberating." 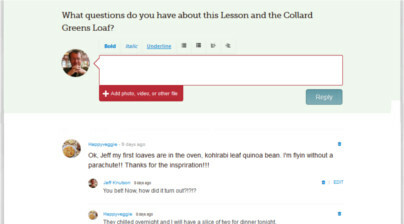 Our students love Loafing Around With Jeff videos because you'll see the entire process from beginning to end. You'll see all of the ingredients I have in my fridge, freezer, and pantry (such as beans and whole grains, fresh veggies, nuts, seeds, etc). Next, I'll select many of them to make a whole food plant-based veggie loaf on the spot -- without a recipe to guide me. This is just what you'll learn how to do in this class! This includes the secret to your Loafing success: The Binder! Made with healthy whole foods like nuts and seeds. Then, I'll show you how to cook it up for best results. As well as how to properly store (for future meals) as well as reheating tips (if you don't eat the whole loaf in one meal! You'll be helped tremendously just by watching how I make these FREESTYLE veggie loaves improvisationally right in my own home. If You Miss That Central Focus On Your Plate That Many Vegan Meals Are Missing, Then You'll Love Creating Veggie Loaves! "Before Loafing Around I was in search of a loaf recipe. I was not even sure it could be done. I tried some that I found on the internet and even tried to make a few on my own. No success! "After taking this course, I can now have a loaf that I can serve for dinner or make sandwiches for another meal. I like the idea that I can make a loaf at any time using whatever I have on hand. The binder is the key, I could never figure out how to hold it all together after it came out of the pan." "Before taking this course I had made veggie loaves maybe five or six times in 2 years, always from a recipe and was never happy with the texture or the flavour. I am now confident in making a loaf without a recipe, and love the fact that it means I am getting seeds, especially flax, chia and pumpkin into my partner who never eats enough of these. And I love having leftovers to eat for lunch for several days." There are usually 3 main reasons people don't make no-meat Veggie Loaves from scratch. Never even knew vegan loaves were possible! Lack confidence in whether they have the skills to pull it off. Once you discover how easy it is to make your own no-meat Veggie Loaves, you'll wonder how you ever got along without them! Loafing Around is divided into 8 Lessons that will instruct you step by step how to create your very own homemade super deluxe tasty and healthy Veggie Loaves. Day 1: We'll begin with an Introduction and a general overview of the loaf making process. You'll watch a video that will give you a good basic idea of how the Loafing Around technique works. Next, you'll learn about the categories of ingredients so you can pick and choose from what you have on hand at any given time. And I'll teach you all about the no-fail binder you'll use to hold your loaf together every single time—no more crumbling loaves! Then, we'll head straight into our first Lesson with a video that shows you how I made a savory Tofu Buckwheat Loaf from the time I pull the ingredients out of my fridge until it's cooked and ready to eat! (Remember, these are not strict recipes you need to follow—in fact, they're not recipes at all but simply tips and techniques of how to use YOUR favorite ingredients each and every time. Don't like tofu? Don't use it! That's the beauty of learning how to make your very own recipe-free Veggie Loaves. YOU decide what goes in it. Day 2: Today you'll watch as I make a loaf with, among many other ingredients, greens. Yes, you can have your greens and love them too! You'll really start to get the idea of just how nutritious your loaves can be. Day 3: Rice-Millet Loaf is our focus today. You'll love how easy it is to use tender cooked whole grains and pull them into a Veggie Loaf that will completely satisfy you. Day 4: Next up is a Smoky Veggie Loaf that had a great smoky spicy bite thanks to liquid smoke and chipotle powder. You'll learn how to work with varying amounts of a multitude of herbs, spices and other flavorings that will help each and every loaf you make become one-of-a-kind masterpieces. Day 5: One thing I tried during the filming of these Episodes was to mix & match ingredients that sound like they wouldn't go well together, not only to show how versatile the loaf-making process is but also to demonstrate that even though you may think you don't have the ingredients at home to make a loaf, you probably do! My Garbanzo-Kale Loaf seemed an unlikely combination, but the end result was simply amazing. Day 6: Today is Tempeh-Green Beans Loaf and wow what a fun taste treat it was, similar to the stuffing you'll find at most Thanksgiving feasts. Again, this is simply what I had on hand at the time. Every loaf you'll make is completely different from the one before, just as it is for me. Day 7: My Black Bean and Broccoli Loaf was a spicy sensation thanks to the chili sauce I added. By now you'll really start to get the hang of what it means to cook "freestyle" without a written word to direct you; just you and your healthy ingredients. And then by reaching for something new, you learn what you like and what your family likes and that's how you get to enjoy more variety and flavors. Day 8: In our final installment of the course you'll watch a video teaching you how to store loaf slices for the long-term. Each time you make your loaves you can keep some to the side for storing away. One of the great things about Veggie Loaves is that they can be frozen for up to six months so they're ready to go when you're exhausted or too busy to cook. This has saved us so many times from eating junk when both Sassy and I were too tired to cook after a long day. Loafing Around with Jeff teaches you how to create Veggie Loaves that taste like what you'd expect to find it in a restaurant. Loaves that not only surpass everything you expect in a fabulous meal, but also one that enhances your health because the ingredients are the best available. But through it all — and perhaps most importantly — I want you to enjoy the process. 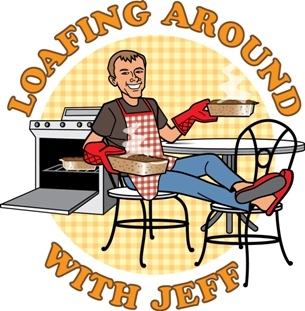 Loafing Around With Jeff includes our easy to use forums. That's because Loafing Around is interactive. Ready To Begin Loafing Around With Jeff? IF YOU DON'T WALK AWAY FROM THIS CLASS COMPLETELY INSPIRED AND EXCITED ABOUT YOUR NEW SKILLS EMBRACING THE SIMPLICITY OF COOKING WHOLE FOOD PLANT-BASED VEGGIE LOAVES WITHOUT A RECIPE, THE COURSE IS FREE. Q: I'm a new Vegan. Is this course for me? A: Maybe. We consider Loafing Around to be an advanced course in vegan freestyle cooking. It's okay if you haven't cooked without recipes before. But it's more important that you have a good handle on which foods make up a vegan diet and how to work with them (such as how to clean and prep vegetables, how to prep and cook whole grains and beans from scratch). Is your kitchen (cupboards, fridge, freezer) organized and stocked with everyday vegan ingredients such as nuts and seeds, herbs, spices, and flavorings? If not, we recommend starting with our complete vegan kitchen management course -- Vegan FUNdamentals -- as a prerequisite to taking this course (a beginner's cooking course and perfect for those new to eating a plant-based diet). Q: I am the only vegan in my household. Will your course work for me? A: This course is especially for you! As mentioned above, if you're in a split family with some Vegans and some non-Vegans, then meatless Veggie Loaves are the one thing everyone can usually agree on. Plus, since you don't use recipes you can focus on the flavors your family loves and leave out any they don't. A: You'll receive one Lesson per day until the course has been delivered (which takes 8 days from start to finish). Each Lesson will take you approximately 20-30 minutes of your time. Of course, you'll also want to figure in time to make your loaves as your schedule allows. Once all the Lessons have been delivered, you can come back any time to review (for instance, on weekends) when you might have more time to play in the kitchen. A: Yes! Shoot me an email through our Contact form. Alternatively, you can click here to Chat w/the Coach. Sign up for an available 20-minute time slot, and I'll give you a call to answer any questions you have about the class OR help you determine which of our courses would be a better fit for your current needs and plant-based skill level. Thanks! "There's no other cooking course like this out there! Once you learn the art of loafing there will be no more staring in the refrigerator or cupboard and wondering what to make! I loved learning how to make different loaves with a variety of whatever ingredients were on hand. I also loved the discussions before and after the videos." "I love the process! It helps so much to have a general idea of what to do and then use what you have on hand to pull it together. Now I am making beans and grains to have on hand for meals. I also don't have to worry about what veggies I have on hand or that they won't work because the 'recipe' didn't call for them. Now I can make a hearty main course that not only I'll love as a vegan, but also that my extended family members as non-vegans will also really like." "Jeff's videos are excellent and his comments are thoughtful and helpful. He'll teach you how to make a loaf with whatever ingredients you have on hand. It's much easier than I had imagined. Now I know that when I feel like making a loaf I can probably do it without checking to see if I have everything I need. This course will take your vegan freestyle cooking to a new level." "I loved Jeff's presence. He explained so well before each lesson, that when I watched the lesson, I could enjoy the process and then ask more specific or deeper questions. Jeff was so calm, knowledgeable, and explained things well with precise yet understandable words that even a complete newbie could understand. I felt encouraged that I could ask 'dumb' questions and I never felt less smart than others (even though I'm a new cook) because Jeff made me feel like my questions were valid and worth his time, even when I asked soooo many questions." "I slowly walked out of work after a long week and trying day. A year ago I would have ordered a pizza or made a peanut butter sandwich for dinner. Not today. I pulled out a slice of the loaf from the freezer and put it into the oven. While that was baking I steamed some cauliflower and carrots. Next, I successfully made Sassy's brown gravy, I have never made a good gravy until today. I smashed the cauliflower and added some Earth Balance, seasoned the carrots and adorned the loaf with gravy. It was good! I felt satisfied and not overly full." You're going to love this deliciously fun and creative Veggie Loaf making course! It's time to start Loafing Around! p.s. Remember, you can retake the course at any time at no charge. 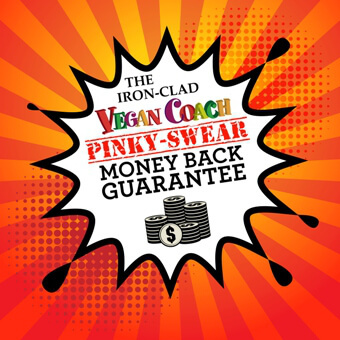 And as with all of our courses you have our personal 100% money-back guarantee so you have nothing to lose. Thanks, and I hope to see you in class! "I have always liked the idea of loaves because they are convenient. I usually do my cooking on the weekends, since during the week things are rushed. And I love to use Veggie Loaves for lunches." "I liked the whole course. It was fun and very interesting. And it gives me a nice challenge to get more veggies in my diet." "Before Loafing Around I tried a few recipes for vegetarian loaves that I didn't like. Now, it's easier to use up leftovers and odds and ends. And I finally have a good binder! I also learned to be aggressive with seasonings. The course makes it easy to "wing it". "I found the binder helpful. (I had used mashed potatoes in the past and it did not turn out as a loaf…more like a veggie mash!) I like the idea of doing the work once and then can freezing for future meals." The Big Question: Do You Miss Having A Central Focus On Your Plate The Entire Family Can Get Behind? Thick and meaty whole food plant-based veggie loaves help you find a use for all those odds and ends floating around your fridge (no more waste!). Feel comfort knowing you've created a filling and nutritious meal based on the flavors you love.